Lance Armstrong's personal cycling coach, Chris Carmichael, has published a new training book just as 7-time Tour de France winner Armstrong finishes his comeback Tour. The Time-Crunched Cyclist: Fit, Fast, and Powerful in 6 Hours a Week presents a new way to achieve competitive fitness and power without the impossible time demands of traditional training methods. The book is available now in bookstores, bike shops, and online. The Time-Crunched Training Program starts with the CTS Field Test, a proven test for establishing a cyclist's personal training intensities. Each of the book's 4 training plans features a complete set of workouts including intervals and instructions. Carmichael also explains how to fuel for high-intensity training and adjust riding to take advantage of new power and speed. The book provides a time-crunched strength training program and supplemental endurance training blocks for cyclists whose schedules unexpectedly clear. Paperback with b&w photographs, charts, and tables throughout. Chris Carmichael was an Olympian and a professional cyclist before beginning his career as a coach, best-selling author, and entrepreneur. He has coached seven-time Tour de France Champion Lance Armstrong since 1990, was recognized as the U.S. Olympic Committee Coach of the Year, and was inducted into the U.S. Bicycling Hall of Fame in 2003. For more information, please visit trainright.com. Jim Rutberg is the editorial director and a coach for Carmichael Training Systems, and co-author, with Chris Carmichael, of The Ultimate Ride, Chris Carmichael's Food for Fitness, Chris Carmichael's Fitness Cookbook, The Carmichael Training Systems Cyclist's Training Diary, 5 Essentials for a Winning Life, and innumerable web and magazine articles. 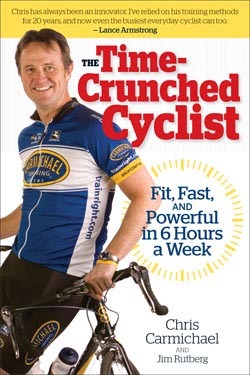 His work has appeared in Bicycling, Outside, Men's Health, Men's Journal, VeloNews, Inside Triathlon, and more.